For the NES and Wii virtual console game, see Mega Man 2. Mega Man II, known as Rockman World 2 (ロックマンワールド2, Rokkuman Waarudo Tsuu?) in Japan, is the second iteration of Capcom's Mega Man series for the Game Boy. 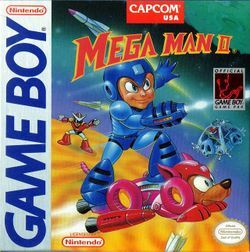 Like its predecessor, the game combines elements from two NES games: four bosses from Mega Man 2 and four from Mega Man 3. It was re-released on the Nintendo 3DS Virtual Console via the Nintendo eShop in 2013. The original Japanese title, Rockman World 2, is clearly different from the NES title, Rockman 2. Unfortunately, in the Western localization such distinction is lost, and both the NES and GB video games are called "Mega Man II" on their title screens. — Back of the U.S. version's box. featuring a different face on Mega Man. This page was last edited on 23 November 2015, at 17:02.